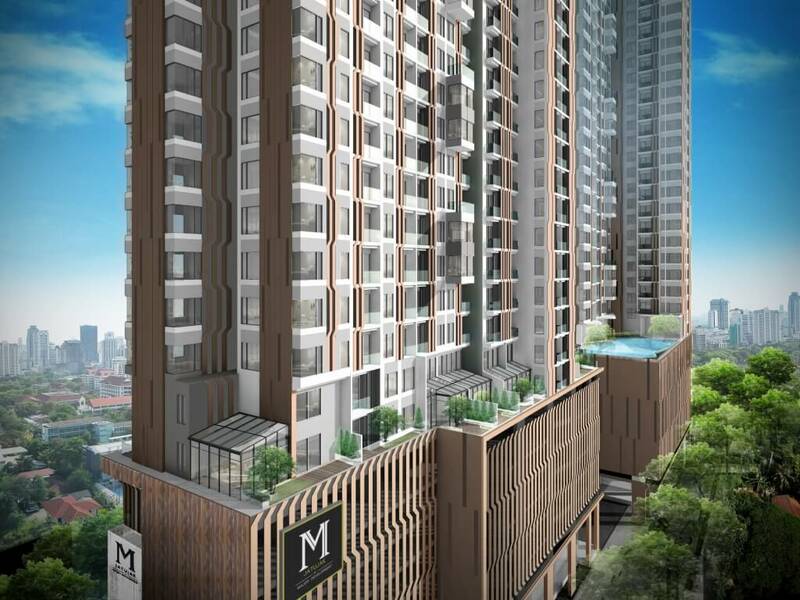 M Ladprao is the ideal choice for anyone who loves to shop, because the project is surrounded by some of the best shopping outlets that it is possible to find in all of Bangkok. Most notable of the shopping options is the vast Central Plaza Mall, located immediately opposite the development, easily reached across the footbridge. Here you can choose from hundreds of different designer shops. 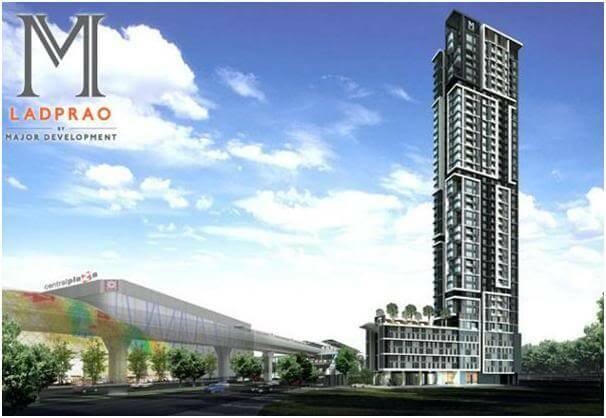 Located next to M Ladprao is a Tesco Lotus hypermarket – for all your grocery shopping needs. The area is also known as Bangkok’s fashion district due to the many smaller, designer fashion boutiques which can be found here. 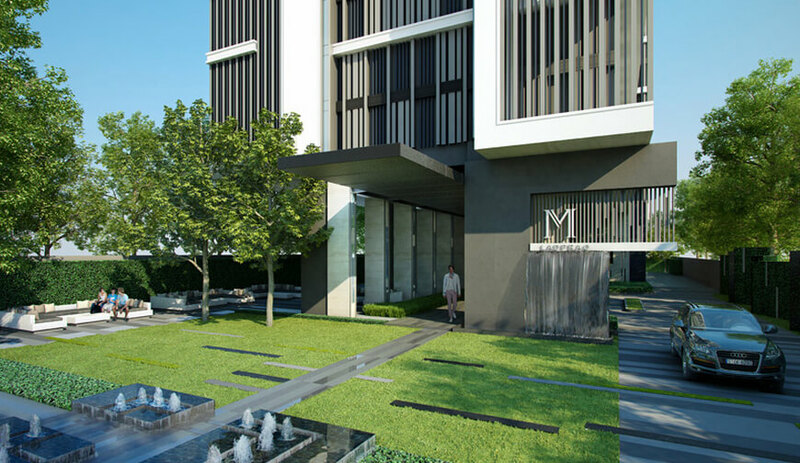 If all of the shopping and entertainment options right on your doorstep are not enough, the fact that M Ladprao is located less than 400m from Phahon Yothin MRT station means that you can be right in the heart of downtown Bangkok in a matter of minutes. 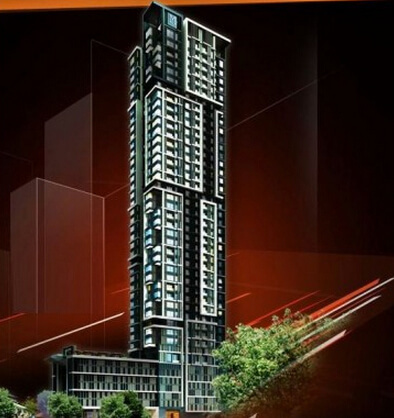 M Ladprao consists of a single slim tower which rises 44-floors into the sky and contains a total of 315 apartments. 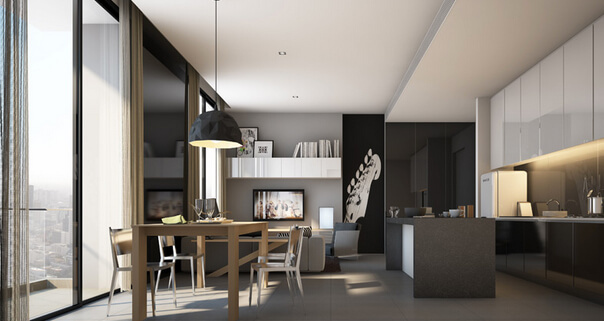 This means that the majority of apartments in M Ladprao have stunning views across the beautiful greenery of Jartujark Park located just 800m from the tower towards the cityscape of downtown Bangkok beyond. Two other large parks – Wachirabenchatat and Queen Sirikit area also within easy reach. 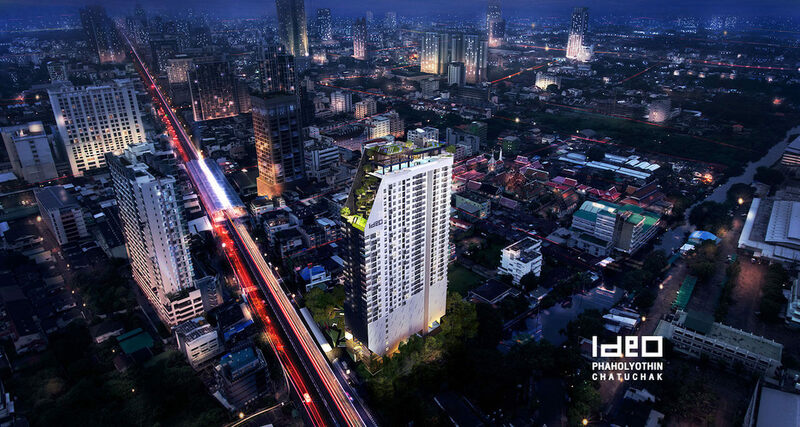 Designed by some of Thailand’s most creative architects and being developed by one of Thailand’s top, publicly-listed developers. 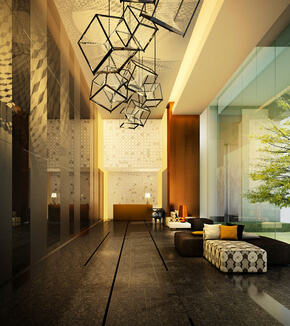 M Ladprao is a beautiful, modern-looking building which features an exciting design based upon irregular cubic shapes – similar in style to the Ritz Carlton Residences – Bangkok’s most expensive and exclusive development. 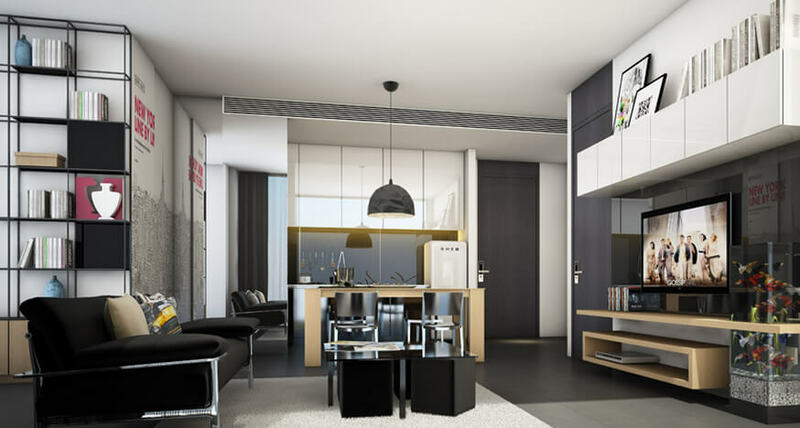 As can be expected from such an exclusive development, the facilities at M Ladprao are all first-class all the way. 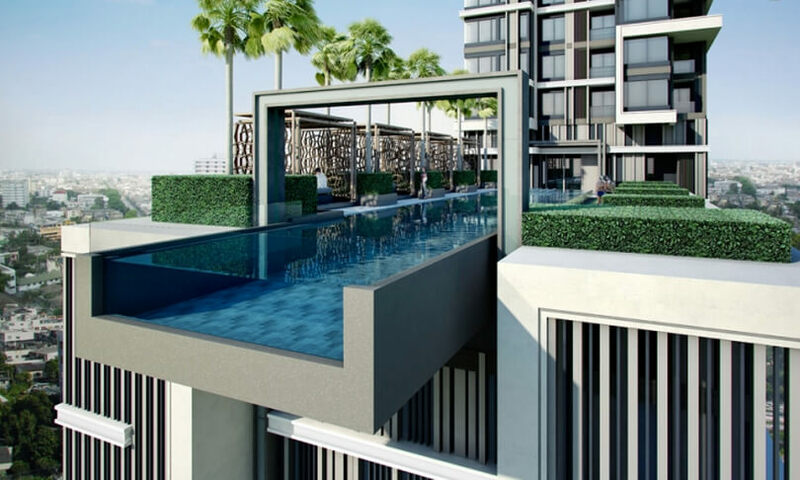 M Ladprao features a beautiful, glass-fronted infinity pool so that you can see high over the city as you swim. The swimming pool also offers bubble-jet spa seats. Also located by the pool is a fully-equipped fitness centre, panorama lounge, library, karaoke room as well as a private garden spa and sauna. 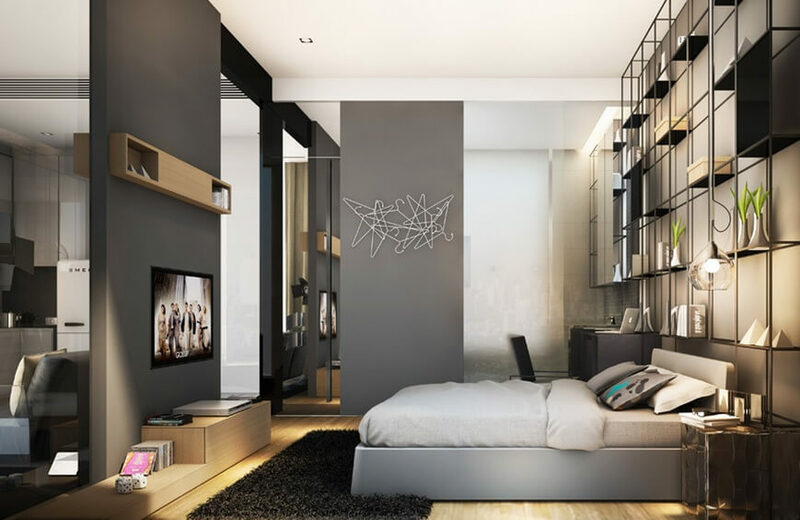 All apartments at M Ladprao are supplied on a fully furnished basis, with a choice of two distinctly different furniture packs to represent your own personal style – in keeping with the fact that M Ladprao is the perfect project for chic city-dwellers. Here you can choose from either the sleek, confident and fashionable Masculine style, or the more feminine Modella style, which features more curves and colours.